Even after the world and humanity itself have been rendered nearly unrecognizable by genetic engineering, a day in the office can feel…Sisyphean. The company stands atop a tiny deck supported by huge iron columns a hundred meters high. The boss there is its president—a large creature of unstable, shifting form once called “human.” The world of his dedicated worker contains only the deck and the sea of mud surrounding it, and and the worker’s daily routine is anything but peaceful. 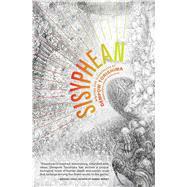 A mosaic novel of extreme science and high weirdness, Sisyphean will change the way you see existence itself. Dempow Torishima was born in Osaka. He graduated from Osaka College of Art and worked as a freelance designer and illustrator. He won the Sogen SF Short Story Prize with his debut fiction “Sisyphean” (Kaikin no to) in 2011. Since then, he has been writing a series of stories in the same far-future world of Sisyphean, which was published as Sisyphean and Other Stories in 2013. The book was chosen as the best SF of 2013 in SF Magazine, won the Japan SF Award, was nominated for the Seiun Award in 2014.